Pastor David J. Blackman during an infant Baptism. 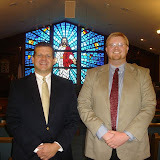 Click on the ABOVE photo to view archived albums of his ministry and that of other pastors at Mt. Zion. BELOW are a medley of some of the album images for viewing. Our Homecoming 2006 Guest Minister, the Rev. Matthew Nelson, was a former 2001 Mt. Zion Summer Intern. Shown with Rev. Blackman. photos ​by clicking Download File below. Visit the bottom of History page 1 for oldest Historical​ Photos. or the Currituck Charge, please Contact Us. ​& webminister of Mt. Zion UMC. Please inquire for permission to use. The winter of 2005, construction began on a new Currituck Charge parsonage located in Soundside Estates in Grandy. It was dedicated June 18, 2006 under Pastor Glenn H. McCranie in time to provide a home for our new minister, the Rev. David Blackman with his wife Jackie with their sons, Jacob and Joshua. Pastor David's ministry led us faithfully from July 2006 - June 2010. He is well remembered for organizing our Mt. Zion Youth Fellowship; Disciple bible studies; plus expanding into local hands on missions including helping to establish the Lower Currituck Food Drop that eventually led to establishing the first LC Food Pantry in Grandy. He also served faithfully as Chaplain for our Lower Currituck Volunteer Fire Department. ​ Click HERE to view archived 2007-2015 Mt. Zion Photo Albums. June 2010 - 2013 we were led and worshiped with the Rev. J. Scott Finicum along with his wife LeeAnn and their sons Isaac and Manny. Pastor Scott continued in the role of LC Volunteer Fire Department Chaplain and led "Journeys of Paul" Cooking Classes bible studies. LeeAnn served as a leader in Children’s Ministries and was an active member of the Joyful Hearts Ladies Bible Study. She also served on a trip as a missionary to Haiti. 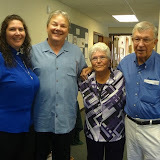 June 2013 we greeted our new minister, Rev. Dawne E. Hollis, with her daughter, Danielle, and granddaughter, Lilly. Pastor Dawne has been active in many church ministries including leading in-depth bible studies and supporting local missions. We looked forward to God's plan for the future of the people of Mt. 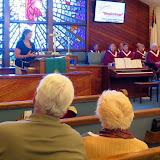 Zion United Methodist Church under her leadership. On October 20, 2013 Mt. Zion hosted a 241st Birthday Celebration. Pastor Dawne Hollis led our service that included for the first time TV screens for viewing photos, scriptural references and other timely content. The Mt. Zion Choir performed and everyone celebrated fellowship during a potluck meal. Images from a slide show historical presentation by S. Grandy [minus the historical narrative] is available for viewing: 2013 Looking back at the History of Mt. 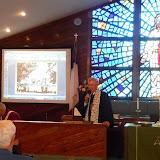 Zion UMC presentation. In addition, the 2013 Mt. Zion PowerPoint presentation may be viewed in slide format offering the opportunity to reflect on many wonderful people of Mt. Zion UMC over the years to 2013. September of 2014 our minister and Frank Custer were united in marriage. Rev. Hollis changed her title to Rev. Dawne Hollis-Custer and we welcomed her husband's support in the Currituck Charge. October 19, 2014, Mt. Zion celebrated her 242nd Homecoming. Pastor Dawne shared the message, Randy Barco shared Mt. Zion UMC history while the choir sang the special. You are invited to view the Slideshow (below) for special details and glimpses of old friends. Mt. Zion's 243rd Homecoming plus a Tailgate Party was held October 18, 2015. Pastor Dawne had a special guest visitor, the Rev. 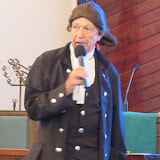 John Wesley (aka the Rev. Glenn McCranie!) You may view photos of the event in the slideshow below "Homecoming 2015." As always, thanks to all participants sharing special music by the Mt. Zion Choir; a first time for Guitar Praise Team songs; church history - plus great food and fellowship! Mt. Zion's 244th Homecoming was held on a beautiful Sunday morning, November 6, 2016. Our special guest speaker was Beacon District Superintendent, the Rev. Gil Wise, sharing a passionate message of faith. More details of this event may be viewed in the captioned slideshow below. This album may also be visited from our website Gallery. Thanks to loyal members for supporting Mt. Zion over many years. Your support and labors of love are appreciated. By God's grace, many more wonderful years are ahead! October 22, 2017 was Mt. Zion's 245th Homecoming Celebration with special guests, the Rev. David Blackman with his wife Jackie and sons, Jacob and Joshua. Pastor Dawne Hollis-Custer and Pastor David Blackman shared leading a beautiful Holy Baptism. An informative History of Mt. 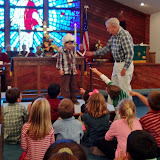 Zion UMC slide show was shared followed by an inspiring message by Pastor David. The choir led a rousing special and a delicious covered dish meal later followed the service. We hope that you enjoy viewing special memories in the slideshow posted below. To God be the glory!